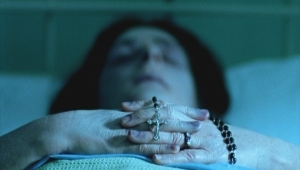 Taken on their own, short films are rarely worthwhile (or meaty) enough to warrant their own DVD releases, often never getting the attention some of them deserve. Good things often come in small packages, making it no surprise that many of the most moving, exciting and intriguing films in history also happen to be only a few minutes in length. They've been recognized at the Academy Awards since 1931---only three years shy of the ceremony's history---in two separate categories: animated and live action. Though the actual name for these two awards has evolved slightly over the years, the spirit has ultimately remained the same. Regardless if you've agreed with the Academy's choices over the years, it's nice to know that this underappreciated section of the film industry gets to shine every so often. The 2005 Academy Awards were no different, boasting five nominees in each of the two "Short Film" categories. Live action nominees included "Our Time Is Up" (Rob Pearlstein, 12 minutes), "The Runaway" (Ulrike Grote, 23 minutes), "Six Shooter" (Martin McDonagh, 27 minutes), "Cashback" (Sean Ellis, 18 minutes) and "The Last Farm" (Rúnar Rúnarsson, 17 minutes). 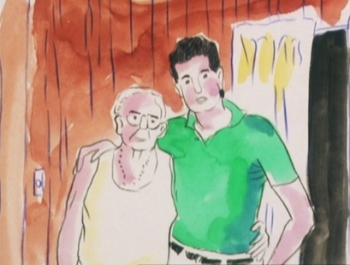 Animated entries included "Badgered" (Sharon Colman, 6 minutes), "The Moon and the Son" (John Canemaker, 28 minutes), "The Mysterious Geographic Explorations of Jasper Morello" (Anthony Lucas, 27 minutes), "9" (Shane Acker, 11 minutes) and Pixar's "One Man Band" (Mark Andrews and Andrew Jimenez, 4 minutes). 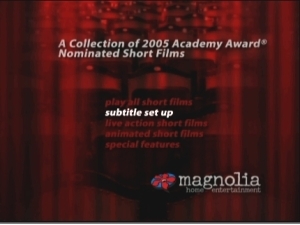 All but the last two entries are included in A Collection of 2005 Academy Award Nominated Short Films from Magnolia Films; more than likely, the exclusions of "9" and "One Man Band" were due to rights issues. Either way, we're still given an entertaining mix of shorts here---including both winners, of course---which clocks in at nearly three hours total. 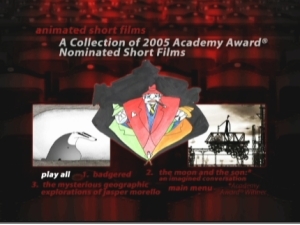 There's a nice blend of light-hearted fare (including "Badgered" and "Cashback", the latter of which is being made into a full-length film) and darker, more dramatic efforts (including the live-action winner "Six Shooter" [above left] and "Jasper Morello" [above right]), though most of these one and two-reelers freely travel between genres. The visually interesting but otherwise meandering "The Moon and the Son" (oddly enough, a winner in the animated category [at top]) represented only a handful of duller spots in this otherwise consistent collection. Magnolia Films' DVD presentation is a bit too straightforward for its own good, but at least it presents the films in their original formats. A lack of bonus features keeps this package from being a truly noteworthy collection, but those interested in the main features only will be more than satisfied. Let's take a closer look, shall we? Presented in their original aspect ratios (1.33:1, 1.78:1 and 2.35:1, with anamorphic enhancement when applicable), the transfers for each short look very good overall. Though many of these films appear to have been made on shoestring budgets, you wouldn't know it by the image quality; fortunately, no major digital problems were evident either. The audio is presented in 2.0 Stereo, while the music and dialogue come through very clearly. Frustratingly, only Spanish subtitles are optional during the main features, while Closed Captioning is not available. The menu designs (seen above) aren't terribly creative, but at least they're simple and easy to navigate. Each short film is presented as its own chapter stop, while no layer change was detected during playback. This one-disc release is housed in a standard black keepcase and does not include any inserts. Given the exclusion of the two animated nominees, it's nice to see a pair of Bonus Short Films included as extras---but sadly, that's all we get here. The two shorts ("The Fan and the Flower" [Bill Plympton, 7 minutes] and "Imago"[Cédric Babouche, 12 minutes) are interesting enough---with the former even including narration by fan-favorite Paul Giamatti---but I'd have preferred more focused supplements, such as commentaries by the directors or at least more background information. This collection just begs for a more coherent presentation, rather than just a cut-and-pasted gallery of nominees. In more ways than one, additional perspective would've really made a difference. 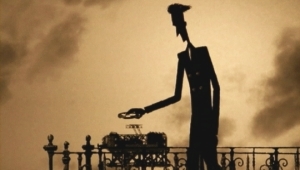 Despite a few nitpicks with the overall presentation, A Collection of 2005 Academy Award Nominated Short Films offers a solid amount of entertainment in one handy little package. The A/V quality is obviously the most important thing here, so it's good to know that these shorts look and sound excellent. More extras would've made this a more potent collection, but those who enjoy quality short films will find it hard to be disappointed with this one. Recommended. Randy Miller III is an affable office monkey based in Harrisburg, PA. He also does freelance graphic design projects and works in a local gallery. When he's not doing that, he enjoys slacking off, general debauchery, and writing things in third person.